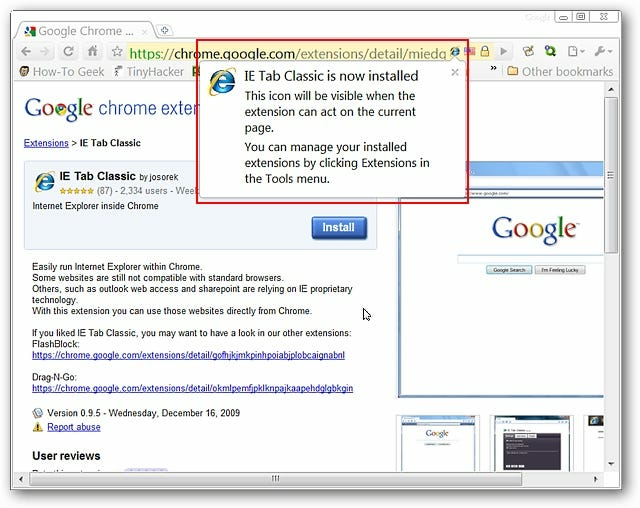 Have you been waiting for IE Tab integration in Google Chrome? 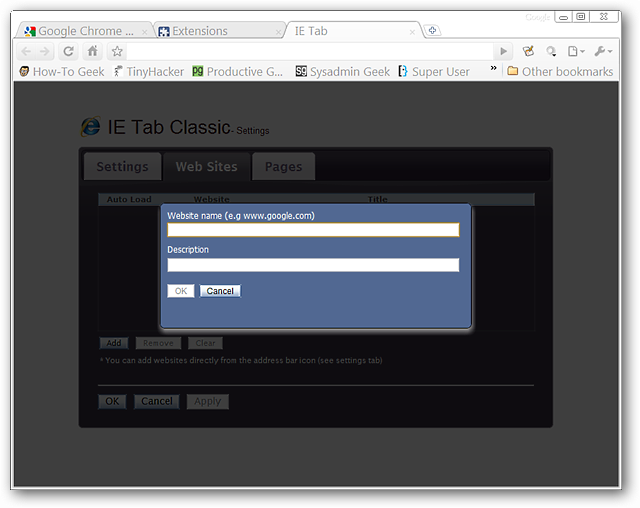 Now you can easily add it in with the IE Tab Classic extension. 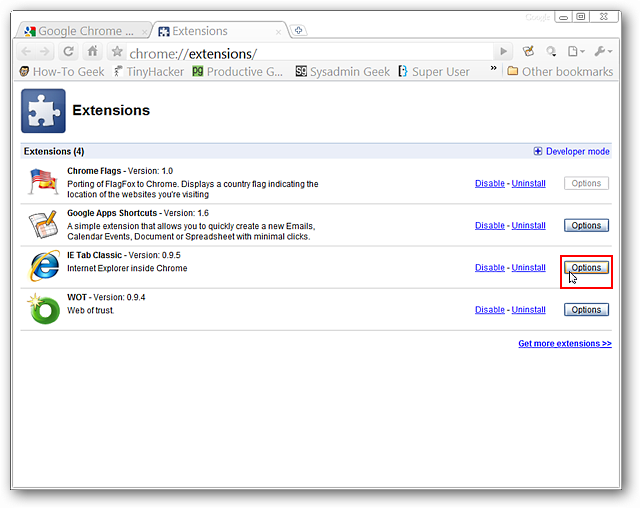 Installation is quick and easy… All that you will need to do is click “Install” when the confirmation window appears. Once the extension has finished installing you will see the following post-installation message dropping down from your address bar. 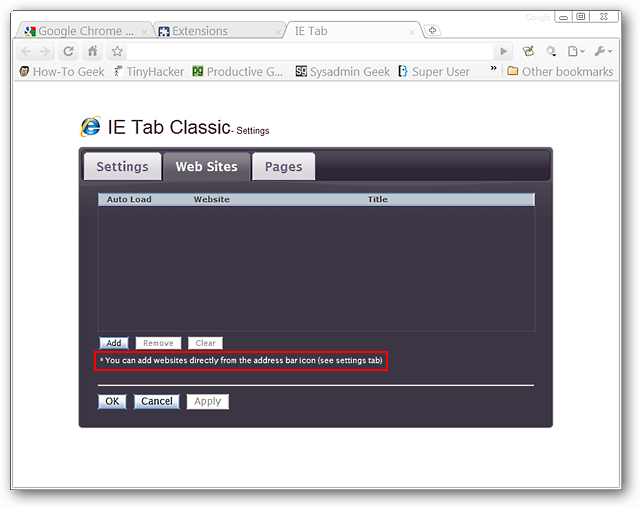 Notice the top part of the message concerning access to IE Tab Classic. 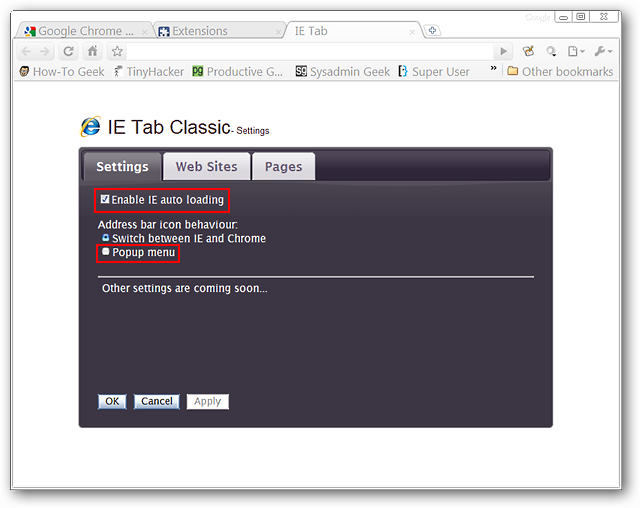 The settings for IE Tab Classic are divided into three categories. 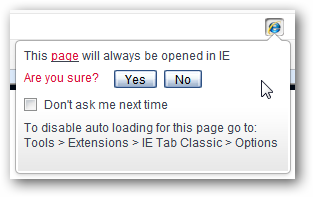 You should leave the “Enable IE auto loading” setting enabled but it is recommended to change the “Address bar Icon behaviour” setting to “Popup Menu” for better functionality (“Address Bar Icon” drop-down menus). 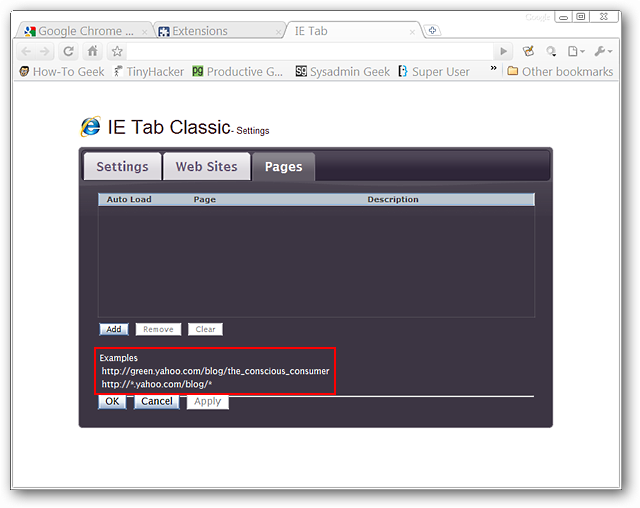 Note: If you leave the “Address bar Icon behaviour” setting unchanged, then the “Address Bar Icon” acts as a simple on/off switch for IE Tab Classic. 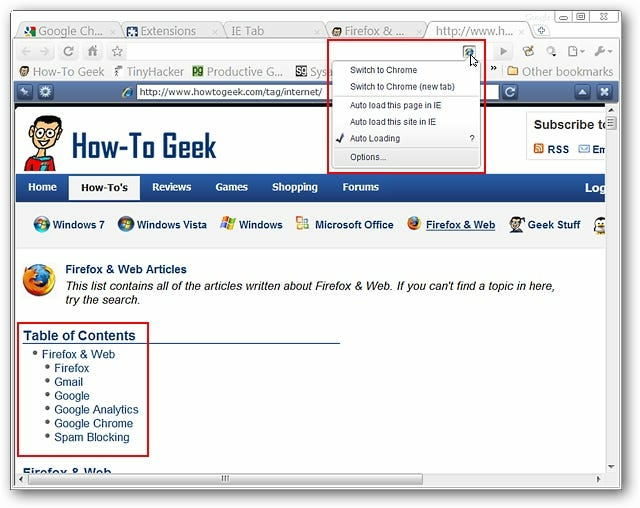 The second tab allows you to add websites to an “Auto Load” list. 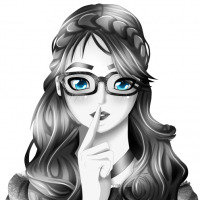 Click on “Add” to open the information entry window. Notice the small message at the bottom…this is where that little “Popup Menu” setting from the first tab is going to be so useful to you. 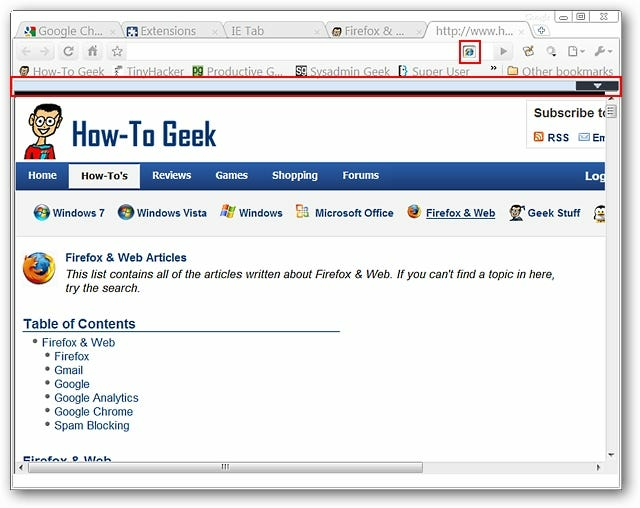 Perhaps you are only wanting a specific webpage (instead of all the webpages for a whole website) to be “Auto Loaded” when you browse there. You can add these addresses in the third tab. 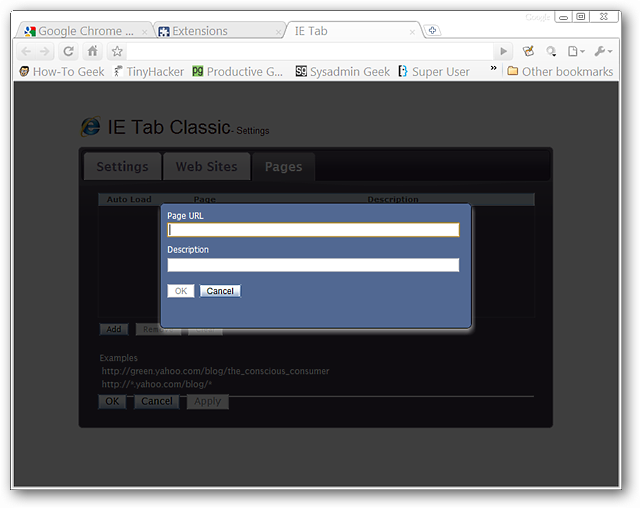 Click on “Add” to open the information entry window. 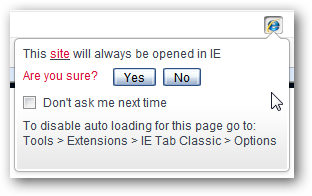 The buttons left-to-right are for “Pinning the IE Bar”, “Settings”, “Refreshing the Webpage”, “Minimizing the IE Bar”, and “Closing the Entire Chrome/IE Tab”. 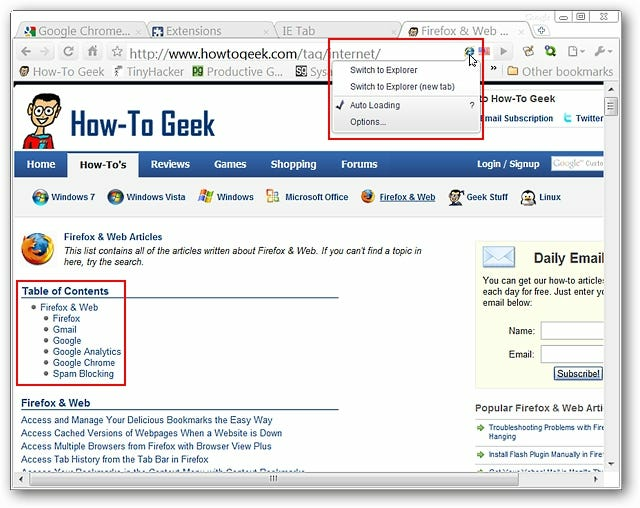 If you have “minimized” the “IE Bar” this is what it will look like…light blue in color with only a “Black Arrow Button” to return it to regular view. The confirmation message for adding a website to the “Auto Load” list…. 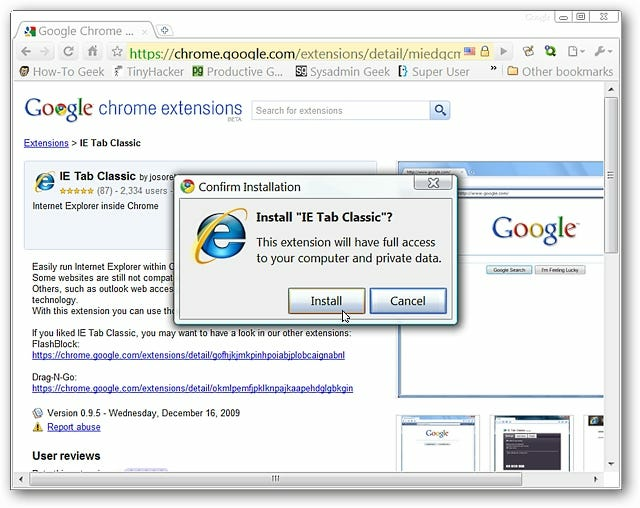 If you have been looking for IE Tab integration for your Chrome Browser, then this is definitely an extension worth taking a good look at.